It's an age-old dilemma: you want Doritos Locos Tacos at all times, but you also don't want the Taco Bell drive-thru staff to know you by name and car model. 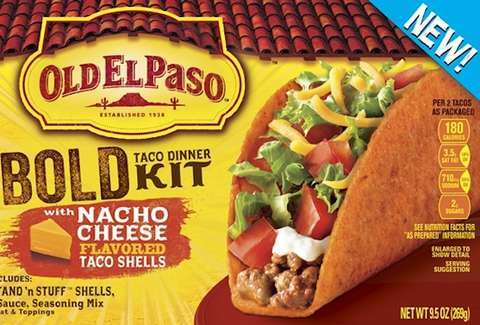 Old El Paso is here to help with their forthcoming nacho taco shells. Hitting stores in August, the Bold Nacho Cheese-Flavored Shells sound and look strikingly similar to the original DLT shells -- they're "blasted" with cheesy flavor after being baked and fried, and have an impressively orange hue. But unlike your usual Doritos Locos Taco, you can stuff these suckers with anything you want. Chicken, beef, pork, fish, even leftover turducken come Thanksgiving, which is what the Pilgrims always intended, but were never able to do... until now. Kristin Hunt is a food/drink staff writer for Thrillist, and would like to make it clear she was joking. Please don't eat a turducken taco. Follow her at @kristin_hunt.